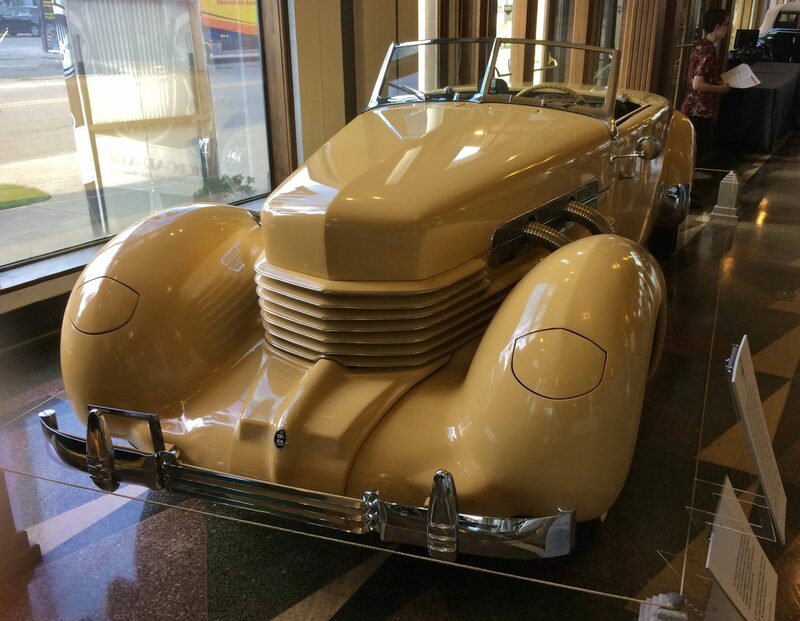 This lovely 1936 Cord 810 “Sportsman” Convertible Coupe is on display inside the Auburn Cord Duesenberg Museum in Auburn, Indiana, and was donated to them by the estate of the late Andrew Adler. We really enjoy this car’s list of unique traits, including the pop-up headlights. It is powered by a Lycoming V-8 engine of 288ci displacement, and has been upgraded with a period correct 1937 Supercharger, which pumps up the output to 175 HP. The 810 is front wheel drive and features a front mounted four-speed semi-automatic transmission with electronic gear preselect. This compact power package allowed for the removal of the traditional transmission tunnel, allowing the car to sit lower with no need for running boards. Just a few hundred examples of the Model 810 were produced in 1936. Positioned between the Auburn and the mighty Duesenberg, the 810 relied on impressive new styling to make its mark. Utilizing much of the technology derived from the L-29 Cords, these “coffin-nosed” models, but far lighter and better balanced than their predecessors. These lovely cars have stood the test of time, but sadly, they were gone from the market by 1937 as the ravages of the Great Depression took a toll on high-end automobile manufacturing. If you have a Cord or another collectible you’d like to insure with us, let us show you how we are more than just another collector vehicle insurance company. We want to protect your passion! Click below for an online quote, or give us a call at 800.678.5173.